As the issue of immigration reform continues to be thrust into the national spotlight, supporters of immigration are using peaceful protests to demonstrate their beliefs on matters surrounding the controversial topic. 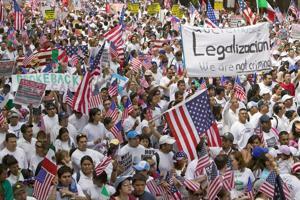 In North Carolina, proponents of immigration reform gathered outside Gov. Pat McCrory’s mansion to show their dissatisfaction with a bill he is expected to sign into law soon. The piece of legislature would essentially make the concept of a sanctuary city illegal in the state of North Carolina. According to the Washington Times, those attending the protest want the bill vetoed by the governor. In New Orleans, pro-immigration activists participated in a nine-day fast directly across the street from the Federal Appeals Court building. The 13 participants wanted to end the delay in a decision involving President Obama’s executive order that would provide deportation relief for millions of undocumented immigrants, according to New Orleans Public Radio. Donald Trump, the leading presidential candidate for the Republican party, has been very outspoken against immigration along his campaign trail. Immigration advocates assembled outside the hotel, where Trump was staying, in preparation for his political rally in Miami. Multiple groups have come together to express their dissatisfaction with Trump’s policies, according to Fox News Latino.